Was it Einstein who defined insanity as doing the same thing over and over and over, always expecting different results? Chukar hunting might expose some holes in ol’ Einstein’s inference. 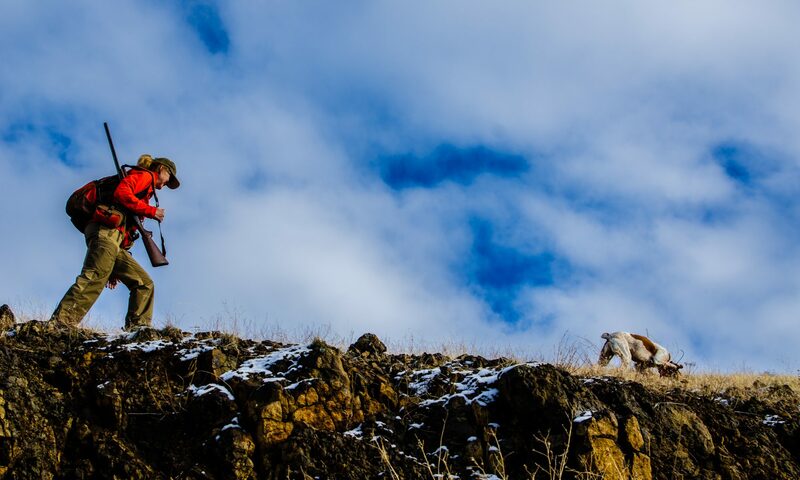 Last weekend I busted major hump looking for chukar in some spectacular habitat which, in seasons past, has held good numbers of coveys. Angus found one covey and I blew the one shot I got. A little pissed, driving home, we rounded a corner near another place I’ve hiked with decent luck and noticed this: a fat guy not more than 50 yards from his pickup shooting straight up the basalt cliffs. Chukar tumbled down the rocky cliffs like rain, much to the chagrin of his giant white poodle who’d run up and sniff the dead birds and whirl away in disgust like Oscar Wilde power-scorning an undercooked scone. Today we bee-lined it for the fat guy spot but another couple had gotten there first and appeared to be returning from their hunt. So we drove a drainage over and headed uphill. When I crested the first ridge and realized the habitat we’d committed ourselves to was vastly inferior to Fat Guy Gulch, I got pissed, yelled at Angus, kicked a rock, and incensed Leslie with my childish behavior. “Total waste of time, not gonna be a single f-ing bird here,” I blurted. Two minutes later, and only twenty minutes into our hike, heading back to the pickup, Angus pointed. A large covey exploded, and I nailed one bird, which Angus brought back. We pursued the busted birds and Angus relocated them within ten minutes. I got another. Ten minutes later we were in the pickup heading back to the fat guy’s spot since the early bird couple were long gone. Angus and I hiked hard for 2-1/2 hours in awesome habitat and saw one piece of semi-fresh chukar poo. Not a bird was seen nor heard. It doesn’t matter, and you truly never know. Just go. Be insane. Do the same thing over and over and over and the results will always differ, despite the best of your intentions. Chris, most of my days this and last season have featured fewer than three coveys. It seems I’m hunting the wrong spots. Are you in Idaho? Yea, I usually hunt the southern end of Brownlee, on the Rocking M Conservation Easement. I’ve had really good luck with north facing bowls with heavy grass cover. The nice thing about there is there are two roads/atv trails that come off of Rock Creek road, so you don’t have to hike straight out of the river breaks to get on the ridge lines. It might be worth it to drive down to Weiser to check it out. I am still perplexed why you would hunt, somewhere that had been hunted twice in the last two days.